This kind of ball always has what they call sun figures. They came from Siberia. They use reindeer mane hair. 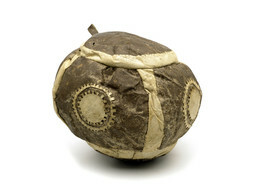 This leather kick-ball from a Yupik community on the Siberian coast is made of shaved seal hide and stuffed with reindeer hair. It bears an image of the sun, sewn on with bleached skin. Sun designs stitched with skin or reindeer hair are traditional, commemorating Raven’s gift of daylight to the world.